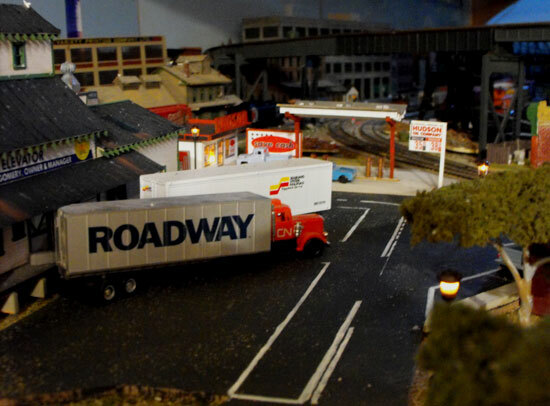 As I continued to fill in the semi-industrial scene at Mintwood on my Utopia Northern HO model railroad, I decided a gas station would make a nice addition at the street corner where I'd put a right angle turn behind the Campbell kit of Montgomery Feed and Seed. While perusing the Walthers catalog to find something suitable I found a Blair Line kit of an older style gas station that would fit in the available real estate that was about 6" X 4". 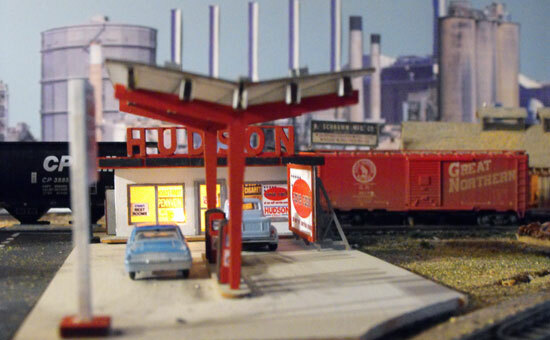 The Hudson Oil Gas Station would look at home in the 1950s to 80s period. 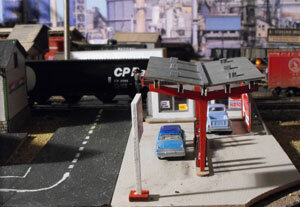 It's an early example of a self-serve gas station with an office service center and a canopy over 4 gas pumps. I had never built a Blair Line kit so I decided to give it a try. The kit's instructions say this is a kit for ages 14 and up and can be built by a beginner. While true, there are a couple of things that one should be aware of. This is a laser-cut structure building kit with unique tab and cut wall slots and floors for easier assembly. The bulk of the work involves painting and applying peel-n-stick trim and details. The instructions advise priming all parts to avoid warping of the thin veneer. I primed everything before detaching parts with a gray primer spray. Parts will still warp. The pieces needed to be placed under weights while the paint dries. The parts are well numbered and correspond to a well laid out page in the instrutions. I caution modellers to paint the parts before detaching them. I find that normally at least two coats of paint are needed. A lot of this kit is white. This can take 4 or 5 coats to get good coverage. I used Polly Scale white at first and then switched to DecoArt acrylic craft paint. The other colors were all various Polly Scale paints I had. Some of the pieces are peel-n-stick so only the top side needs to be painted. Others need to be painted on both sides. It's necessary to give the paint time to dry under weights. The kit goes together as advertised, but it's stall wise to use machinists' squares or other methods to check the plumb of walls before the glue sets. I also use bar clamps to ensure the walls are securely joined at the joints. 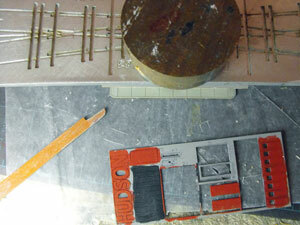 Fast Track metal jigs are handy for weighting the parts. Use whatever you have. When you begin to assemble the building, remove only the parts you need. The manufacturer includes a small "V" indication where the part needs to be separated from the sheets. This is a great feature. The edges of the piece should be sanded to remove the little nubs. I found one of the trickiest parts of the assembly was to attach the roof. Paint can make the wood swell as well as warp. I cut down the end of an emery board to fit in the slots in the roof to clear out paint residue and to improve the fit. I had intended to leave the roof loose because I added some figures and a grain of wheat 12 volt bulb inside the office and store. However, due to the warping tendency I took a chance and glued it in place, Hopefully, I never have to remove it! The canopy also proved to be a little more difficult to assemble because the uprights are unstable when trying to glue the beams into the slots. I was using yellow carpenter's glue. A tacky glue might have made it easier, but I didn't have any. Anyway, I managed to get it done by working slowly and carefully. Then I touched up the edges of all the parts. The paint doesn't reach the edges while attached in the sheets. I also had to touch up some mistakes. The kit comes with a sheet of peel-n-stick signs, billboards, and the parts for the gas pumps. The most difficult work is to cut out the tiny prices and signs for the gas pumps. Use a new blade and a metal straight edge! I use an NMRA ruler. I decided to use the 35.9 price for regular gas on the roadside sign. That gets a laugh when visitors notice it. I mounted the scene on a piece of masonite and painted it with concrete paint left over from a Woodland Scenics road building kit. 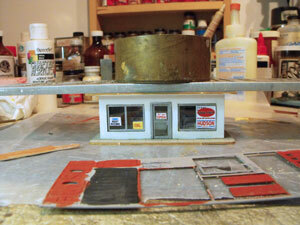 For weathering the gas station I used some black PanPastel® artist's pastels to add oil streak smudges near the gas pumps. The masonite butts up again the roads installed previously. Hudson Oil gas station placement. I installed the scene with the canopy beside the office instead of in front because I didn't have the depth. I also added a truck at the store and a car by the pumps. I had drilled a hole in the floor of the store and through the homasote and plywood sub base so I could route the bulb's wires to the terminal strip used for the street lamps. 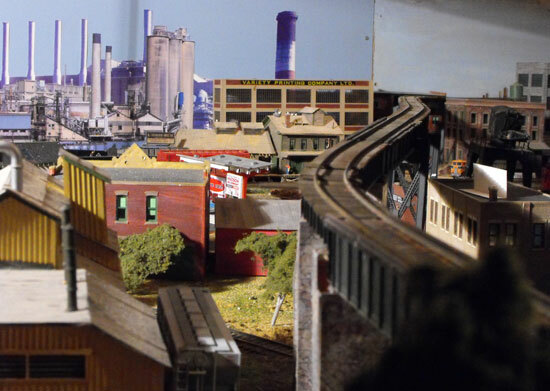 Here are a few photos of the completed scene from various angles. Hudson Oil and Mintwood overview from the back. Utopia is in the background. Hudson Oil gas station from the end. I would certainly recommend a Blair Line kit to any modeler with a modicum of experience and the patience to give the paint time to dry when doing the structure building. Go from "structure-building" to kit building overview. Go from "structure-building" to cardstock and paper sructures. Go from "structure-building" to Clever Models paper buildings. Go from "structure-building" to Scratchbuilding for beginners. 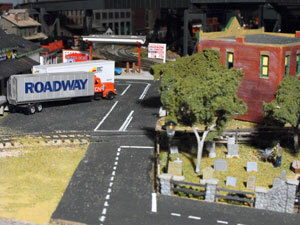 Go from "structure-building" to Campbell Scale Models freight house . Go from "structure-building" to How to build a rail barge (carfloat) . Go from "structure-building" to How to build a moveable barge . Return from "structure-building" to my Home Page.